A few weeks ago I had the opportunity to visit Cincinnati, Ohio. They had an awesome parade celebrating bock beer, some vintage lagering caves, and a ton of breweries that are most definitely worth checking out. One of my faves in the mix was Braxton. 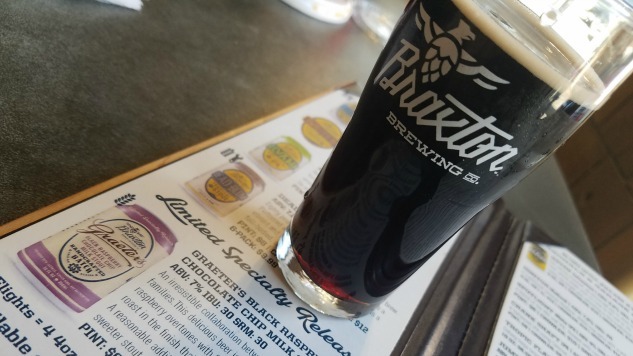 I had a few tasters at Braxton, but one of my faves was its Graeter’s Black Raspberry Chocolate Chip Milk Stout. One of the people I was with had sung its praises while we were on the way to the taproom, so it was a must-hit before I even arrived. That said, I’m really glad I did try it. Graeter’s Black Raspberry Chocolate Chip Milk Stout is exactly what it sounds like: a milk stout with black raspberry. While arguably most milk stouts have a sweet feel to them, the lactose plus the sweetness from the fruit in this one makes it even more on the sweet side than normal. That sweetness was intended and is recognized by the brewery as well. It was described to me as “liquid ice cream,” a description I’d say is pretty spot on. Braxton has gone all-in on that description and sells glasses at the brewery that look like you’d enjoy an ice cream float in them. Honestly, this beer with a huge scoop of chocolate ice cream in it would probably be amazing. And that fits. It was made through a partnership with local ice cream favorite, Graeters. It pours a medium brown, almost porter like. The chocolate and raspberry are quite prevalent, but you also get hints of dark malt, coffee and toast. The longer you drink this one, the stronger the raspberry seems to be, and the medium-bodied beer has a smooth mouthfeel on-par with what you’d expect with a sweet milk stout. It’s not quite the “ice cream” flavor that everyone raved about, but it is quite delicious and definitely something I could see enjoying as a dessert beer after dinner or alongside a scoop of vanilla. If you happen to find yourself somewhere that has it on tap, do yourself a favor and give this one a try.